Gwen Stefani is queen! This look was inspired by my No Doubt Tragic Kingdom CD score, which I got for $1 thrift shopping in San Diego. Gwen Stefani is no doubt (see what I did there?!?!) one of the key 90s fashion icons with her abs of steel & crop tops to show them off. From her bindis to her track pants & rocking belts, Gwen's style from the 1990s was legendary. Style is all about changing things up, trying new things, & becoming who you are as a fashion guru. 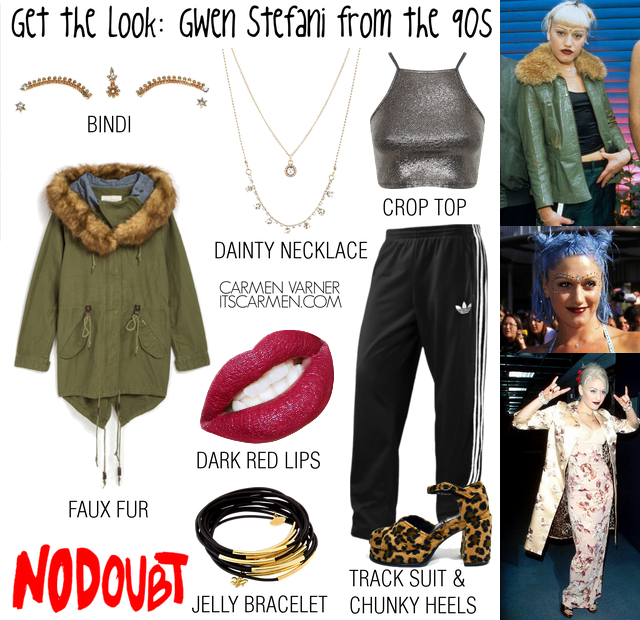 Get this classic 90s grunge Gwen Stefani look! First things first, you're going to need a crop top. One of Gwen's signature looks (to this day) is a bare midriff, making the crop top one of her staple items. Next up is some sort of tracksuit pants, sport pants, or any kind of killer pants. If possible, pair it with a really badass belt. The chunky heel was very popular in the 90s, so find one from your mum's closet & rock them like there's no tomorrow. As far as jewelry, Gwen kept it pretty minimal. Layer dainty, barely there necklaces. Notice in these photos you can hardly tell she's wearing a necklace. It's very minimal. Her bracelets are a little heavier; I opted for adding some cool jelly bracelets. One of Gwen's most iconic features were her dark red lips & her bindis. Your look wouldn't be complete with either of these two. Lock them down to make your look easily recognizable. If you're trying to style it in your own way, mix it up. Get some of that iconic Gwen Stefani garb & blend it with your own stuff. What do you think of Gwen's style? If you had to utilize one look from Gwen's trends, which would it be? She was always a little out there but totally on trend now with her athletic pants and utility jacket!! I really love her and her rebel style! Your collage is so spot on! Gwen Stefani was my fashion IDOL growing up. She's still equally as fantastic! I definitely love those heels! They are super cute! I love it (and I loved your pun...made me giggle)! Gwen in the 90s was awesome, and I love her now too. That jacket looks pretty cozy too, I think I'd like that now! This is amazing! Obviously I love her, she's an icon. Merry Christmas! Gwen Stefani and her style are both amazing! 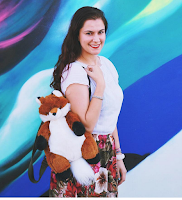 Love this post and your recommendations! YAS!! I wanna try this, its actually so cute! I love this 90's look! Gwen sure knows how to rock any look! This is definitely 90's! I loved Gwens style back in the day - she was always so cool and like ace! No doubt was a great band. I remember trying to steal this look back in the days. Sadly, then as well as now I was missing her abs and her self-esteem, always feeling uncomfortable. The only time I didnt feel out of place rocking a Bindi was at a Hindu wedding 😄. Interesting how you can recreate the looks from the 90s. Cool post! Being that I'm obsessed with the 90s I had to check out this post. Love it.